Ahhh...I think I have totally recovered from my trip to AZ!! Boy it sure is hard getting back into the swing of things after you have been gone for a week!! My first official 'ok,, back to work now' card is the Wednesday Challenge for the Digi Shack. Our challenge this week was to make a card with the focal point being green. And speaking of green....HAPPY ST. PATTY'S DAY. I'm soooooooooo not Irish, but hey, it's a holiday right?? I'm not a huge green fan...but I just LOVE pink...so I put a bit of that in there too!! If you get the chance, go on over to the Digi Shack and look this little guy up. While you are there, take a look at all the wonderful images she has to offer....you won't be disappointed!!! HA HA HA!!! I LOVE what you did with this fish!! LOVE it!!! He's one of my favorite images, too! Love your fishy and the pink lips is great!! You rocked this green challenge!! so stinkin' cute! I love the way you've colored this, great card! WOW! Christina this is really cute! I love the color combo and the dew drops. I dont know how many times I can say this but, your soo talented and Im blessed to have you as a teacher. Bahahahahaha! Every time this fish makes me laugh! Too cute! Love it! Love your card with the pink! So very cute! I love this digi!!! Great colors!!! Love the "bubbles"!!! bwa ha ha ha! look at those HUGE pink lips!!! what a awesome card! I love that image! great job. 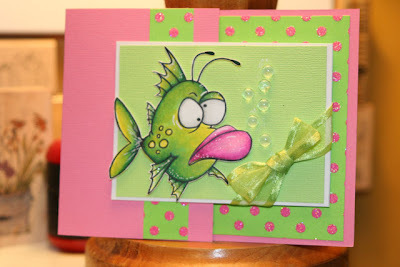 Love the colors you used and fish is colored perfectly! Such a cute card! Love that image. Too funny! Awesome image! Love his eyes and lips! Pretty colors! Fantastic job! Love the colors and that fish! Happy Birthday to my Son, Jeremy!! !